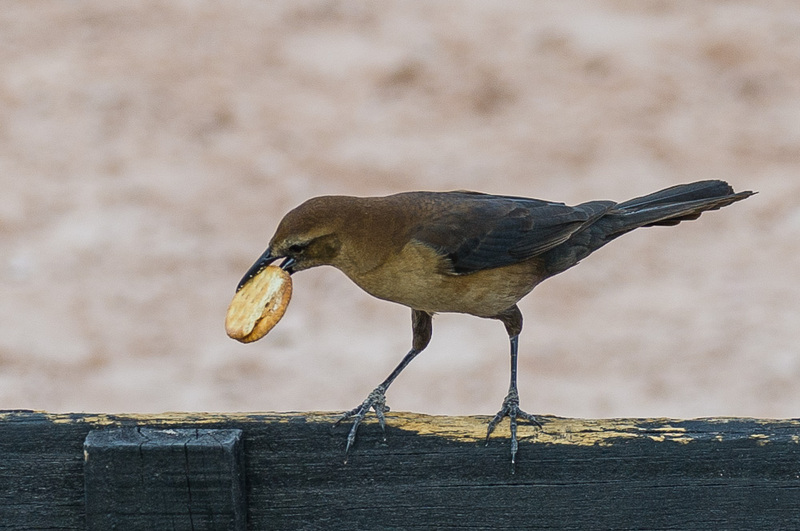 This female Boat-Tailed Grackle entertained us last week in Florida. This brave bird didn’t hesitate to come inside our exhibitor hospitality tent at the horse show to try to steal snacks. She would hang out at the doorway, and, when no one was looking, she’d trot in underneath the tables. I was outside photographing at the adjacent show ring when she flew over and landed on the fence rail to eat her latest catch. I’m not sure why she chose to land so close to me, but I thought it might be because I was the one in the tent who never chased her out. Perhaps she sensed the bird lover in me…or she was showing off for the camera! Funny as I was just trying to figure out if I’ve ever seen this kind of grackle before. I think I have! Funny story, and such bravery from this little bird. I’d seen these birds in Florida for years, but a friend’s mother ID’d it for me on this trip. She lives down there and sees them regularly. I understand they are quite bold in general. This one sure was!